Logistics in construction often focuses on the challenges within the site boundary, leaving those outside the gate to be addressed when dictated by the programme. But early in the projects development Crossrail identified this as an area which it wanted to be proactively managed so that impacts outside the hoarding were treated with the same significance as those inside; requiring individual contractors to incorporate logistics practices into their normal working day, and form part of their daily planning. But with 800 hauliers delivering to 30 main contractors across 47 central London sites the largest construction project in Europe had to take the initiative and set a standard for all contracts to follow, thus bringing consistency and oversight to the programme. 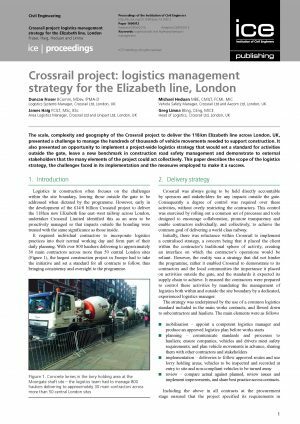 This paper will provide an overview of the principles of Crossrails logistics strategy and how it was implemented, identifying the key challenges, lessons learnt and how it continues to influence other projects and stakeholders. Greg Limna is Head of Logistics for the Crossrail Project, responsible for the projects logistics strategy. Greg joined the project in 2003 to work on the Hybrid Bill submission and in the subsequent years worked on the utility diversions, enabling works and excavated material. He is currently responsible for delivery of the projects vehicle movement and safety programme. Greg started his engineering career in the water industry before joining the Channel Tunnel Rail Link (HS1) and now has 20 years experience of delivering railway infrastructure projects. Duncan Fraser is the Logistics Systems Manager at Crossrail. He is responsible for the Traffic-Co-Ordination Centre, Incident Response Desk, Lorry Driver Training Booking and Vehicle Management Planning System. Duncan spent over 6 years in the property development industry in Australia but switched to the Railway sector when he moved to the UK 5 years ago. He has been with Crossrail since September 2012. James Haig is Area Logistics Manager for the Crossrail Project and a member of the Crossrail Programme Partner Transcend. 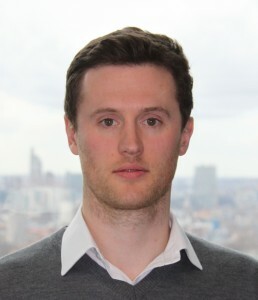 James joined the project in 2009 to work on the logistics strategy and mobilisation for delivering Crossrail. He is currently responsible for managing the engagement with Crossrail’s principal contractors with regards to logistics. James worked on large logistics business transformations in the private sector before joining Crossrail. He is a fellow of the Chartered Institute of Logistics and Transport, and chairs the Construction Logistics Forum for the institute. 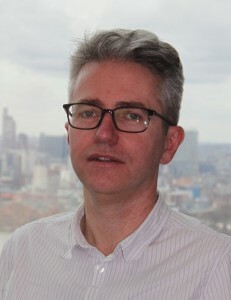 Michael Heduan was the Driver Training and Vehicle Safety Programme Manager at Crossrail. He was responsible for delivering a range of road safety initiatives including the award winning Lorry Driver Training (LDT) course and supporting Crossrail supply chains achieve compliance to meet the projects stringent vehicle safety standards. Michael’s work on Crossrail has provided the foundations for the Construction Logistics for Cyclists Safety (CLOCS) standard which has been widely adopted by the construction industry in London and other parts of the UK. 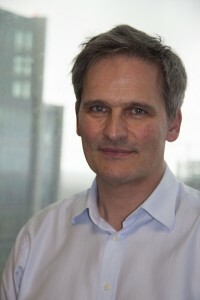 Michael started his career in Telecommunications as an Electrical Engineer and progressed to the position of Global Programme Manager with BT plc. His work in Transportation started over 10 years ago running projects for Transport for London and the London Development Agency. He joined Crossrail in the summer of 2009 to establish LDT in response to Undertaking 577 in The Crossrail Act. Michael was awarded the MBE by Her Majesty The Queen in December 2014 for ‘Services to Road Safety in London’.